This is probably my favourite kind of book – that which combines travel and food. That’s not meals on wheels or in-flight refreshments – this is taking a trip and finding culinary gems along the way. Barbecue Road Trip is one of the most mouth-watering travel/food books around but it will delight and disappoint many of you. “DISAPPOINT”?? I hear you cry (in capital letters because you are crying loudly). Yes, not actually with the book but with the revelation that you might not be able to replicate these barbecue dishes in your own back yard. This volume will delight you with fine photography, witty text and some of the best rub, sauce and slaw recipes around .Barbecue Road Trip has been masterfully penned by Michael Karl Witzel, who has written numerous books about iconic American dining, as well as contributing to The Food Network and History and Travel Channels. Michael gives you the bad news up front. A home barbecue grills food with direct heat rather than allowing it a long slow process available only from indirect heat. The flavour of authentic barbecue comes from the meats themselves and the rubs or marinades. Yes, a slight smokiness is imparted but that’s not the object of the exercise. To make REAL old-fashioned barbecue you need enough space to settle the ribs, joints or sausages away from flames. This is not Fast Food! Tenderness and flavour come after hours of cooking …but it’s worth waiting for. 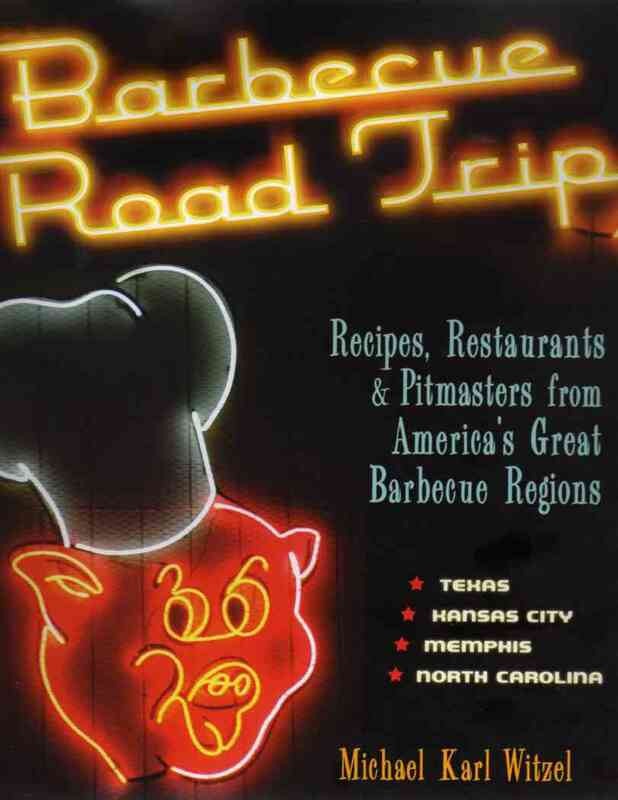 Barbecue Road Trip is a barbecue bible. No, it’s not a “you can do this yourself, folks” type of book; it’s a “these are the most marvellous restaurants around” type of book. No marks out of ten are given and no style of preparation is preferred. Michael has toured and talked, and presents you with an incredible overview of the art in Texas, Kansas City, Memphis and North Carolina, each one a hub for barbecue aficionados. Americans can be proud that they have introduced the world to the home barbecue. That’s an event we all enjoy but it’s not the same as savouring food from a barbecue pit with a tray of traditional side dishes. Those slaws and potatoes and sauces will differ with every establishment but all those restaurants have things in common: the food will be tempting, the clientele will be loyal and the decor will be rustic …the recipe for the rub or marinade is also likely to be a secret.